Wisconsin Rapids, WI – As the Wisconsin Rapids Rafters approach their 10th season, the team has announced the addition of Hannah Jurgens to the 2018 front office staff as the Accounts & Corporate Service Manager. Jurgens enters her first season with the Rafters as the Accounts & Corporate Service Manager. 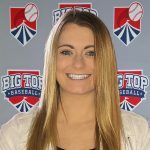 She started her baseball career as an intern for the Rafters during the 2018 season. Jurgens works with corporate sponsors to execute sponsorships, as well as Rafters 9 Game Pack holders and groups. She will also oversee the promotional team to continue adding a unique ballpark experience. Jurgens is a graduate of Fort Hays State University where she played soccer and worked closely with the school’s athletic department. She received two bachelor’s degrees, one in Marketing and another in Health and Human Performance, with a concentration in Sports Management, graduating in the spring of 2018. The native of Lincoln, Nebraska enjoys spending time with friends and family, traveling, and cheering on the Chicago Cubs and Nebraska Cornhuskers.